Check out our very popular line of Graduation Molds! 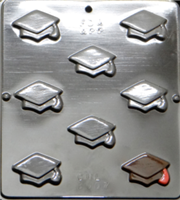 Whether you are looking for a diploma chocolate candy mold or mortarboard and scroll chocolate candy mold we have it! Or perhaps our most popular graduation oreo cookie chocolate molds! Lastly, we have business card size graduation candy bars or a simple congratulations candy bar to mark and celebrate the academic success of your graduate!